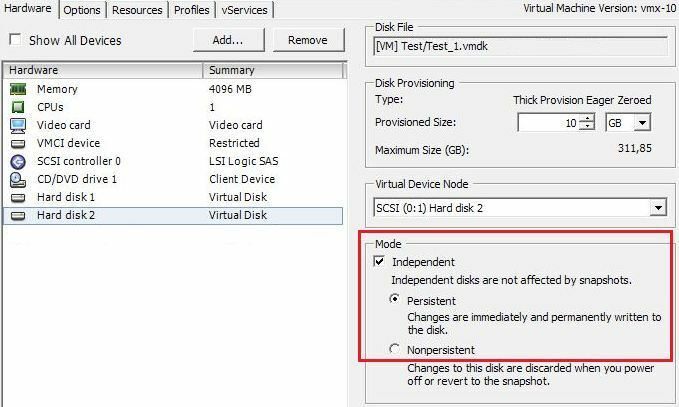 It is possible to exclude a dedicated virtual disk (vmdk) from snapshot operations. A usecase for this is eg. an IO intensive SQL server you want to backup, but where there are so many changes that it is not possible to close the snapshot within a reasonable time after the backup completed. In this case you can exclude the partition with the database from snapshots and backup the SQL DB with other tools (eg. with TSM TDP SQL). When you use the independent disk mode option you can of course still use features like vMotion and Storage vMotion. Cannot take a memory snapshot, since the virtual machine is configured with independent disks. If you do not set the option to yes, the entire virtual machine is bypassed by the backup operation if it contains one or more independent disks!